Coming from Athens, Corinth is the first prefecture you come to in the Peloponnese; the first sign of warmth and excitement. The aromas of the sea, the mountains, the harvest of the grapes and the currants are all encompassing, accompanied by the sound of bees buzzing around the sheds where the currants are drying. Here you will rediscover some old Greek myths, learn that Nemean wine is called “Herakles blood” and that retsina is the teardrop of a certain wood nymph. You will find out about gods, nereids and mortals; Zeus and Apollo. You will come upon columns, sanctuaries and ancient palaces. all the way to Lechaion (Leheo), the artificial harbour on the Corinthian Gulf. 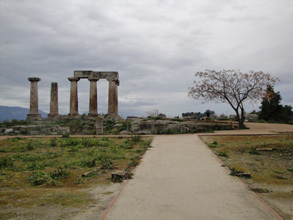 Lechaion was the start of Lechaion road which led to the Ancient Agora. This was paved with flagstones and lined with sidewalks, arcades and shops. The area of the marketplace was filled with imposing buildings, temples and business emporia. The Doric temple of Apollo (6th c. BC with 1st c. AD restorations) stands on a knoll to the north of the agora; and it is the most important monument of that period. To the northwest of the agora lie the ruins of the 4th century BC theatre – which underwent some changes in the Roman Odeon. The museum is in the southwest sector of the site. It contains mosaic floors, Mycenaean and Corinthian pottery, terra cotta sphinxes, statues of two supernatural beings, relief plaques, the Roman head of the Goddess Tyche and small objects of various kinds. On the north side of the building one can see the remains of the fountain of Glauke hewn out of the rock. Glauke, daughter of king Creon, was the reason why Jason deserted Medea. In revenge Medea sent her as a wedding gift a poisoned mantle which envelopped the girl in flames the moment she put it on. In order to save herself she leapt into the fountain which since then has borne her name. The most important attempt to pierce the Isthmus in ancient times was made by the Emperor Nero in 67 A .D. During that year, several thousands of workers dug away at the Isthmus for more than three months. The vestiges of the work carried out at that time indicate that the designers of the project had chosen the narrowest point of the Isthmus for the purpose, following the same line as the modern canal. The digging began either side of the canal, and the workers were supposed to meet eventually in the middle. Nero’s death put an end to the project. Work was only resumed again in 1881 and completed in 1893. 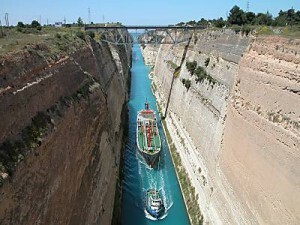 The canal is about 6 km long; its width upon completion was 25 meters, and 8 meters deep. edge of the ancient city. At the top of the pinnacle, at an altitude of 575 metres, stood the acropolis of Corinth during ancient and medieval times. This is the largest and oldest fortress in the Peloponnese. 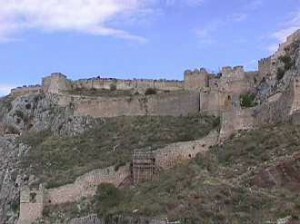 The Franco – Byzantine – Venetian fortifications (built atop the ancient walls) and Turkish additions have left deep signs of their successive claims to supremacy. At the summit, which offers a magnificent view, there were a vast number of shrines and temples dominated by the Temple of Aphrodite. Lower down is the Upper Peirene Spring. Pausanias mentions that Peirene was a woman who was transformed into a spring by the tears she shed for her son who had been killed by Artemis.